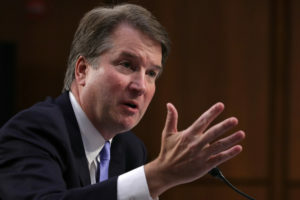 WASHINGTON — President Donald Trump sided with his embattled Supreme Court nominee, defending Judge Brett Kavanaugh against allegations of sexual assault as the White House walked a fine line in addressing accusations that revived memories of the president’s own #MeToo moments. Time and again, Trump has defended powerful men against the claims of women. “He’s an outstanding intellect. An outstanding judge. Respected by everybody. Never even had a little blemish on his record,” Trump told reporters at the White House on Monday. President Trump defended nominee Brett Kavanaugh on Monday from allegations by Christine Blasey Ford that he sexually assaulted her decades ago, but also said Ford should be heard out. Lisa Desjardins and Yamiche Alcindor share developments with Judy Woodruff. Even as the #MeToo movement gained steam, giving a voice to women who said they were abused by powerful men, the White House has steadily denied accusations against the president. Trump has frequently voiced support for men who faced accusations.